My Esthetician studies my skin under bright lights and a magnifying glass. On my last visit, she asked, “What are you using on your skin? It looks great!” The answer is Overnight Resurfacing Peel. I’ve been using it for the past few months, and it is my all-time favorite skin care product. I experience significantly less irritation and flakiness now that I have been patting it on my face, neck, and decolletage after cleansing. I’ve learned that patting to apply any product is so much better for our skin than rubbing. When I saw that Overnight Resurfacing Peel is part of the holiday gift set pictured above I didn’t hesitate to purchase a set for myself. (I’ll give it to Mr. Mickey to wrap and give to me when we open gifts.) This and other collections are available (here). 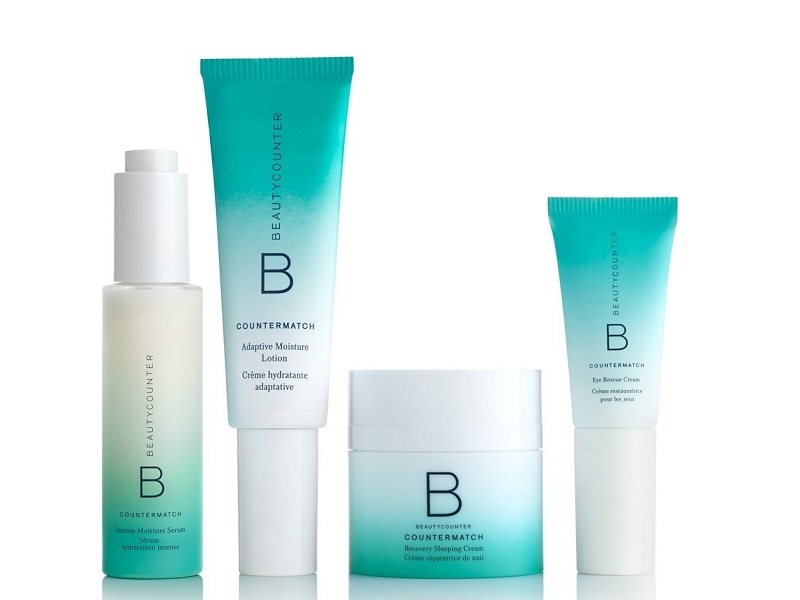 I am such a devoted fan of Beautycounter products; I became a consultant last year. I am happy to report that they do not test the products on animals and the ingredients they use to create all the products are safe. Unlike many skin care products I have used, these have never caused me to have any unpleasant reactions. My Beautycounter site is here. I snapped this selfie on Thursday. (We have had rain for days!) I am not wearing any foundation and very little eye makeup. The lip color is Beautycounter Red (here). I am wearing the navy and red scarf (here). The earrings are old from Target. I’m always happy to share good news with you. There is a new discount code for a favorite boutique, My Fair Lady. Once a year for Black Friday/Cyber Monday they offer 20% off and free shipping on any purchase. The coupon code: Sparkle18. The sun is predicted to shine again this weekend at last. Road Trip! Have a great weekend. I have purchased or received as a gift all of the items shown on this blog. I do not do product reviews for companies that send me free items or pay me to publish my opinion. Referral and affiliate links may generate a small commission for Susan After 60 Inc. I recently bought one of the oils from BC and clicked on your name as my consultant. I love it. Smells like oranges in a bottle. Will be trying some more products in the future. You look beautiful. I always look forward to reading all the wonderful advice you share. . I was wondering if you ever would take a road trip by yourself? Would you think it would be safe?I read about your solo vacation to Florida. It looked like an amazing trip. I am a 68 year old widow and have never traveled by myself. When I read about your vacation I thought how brave you were. What advice would you give me if I wanted to travel alone? Try a short trip to a town nearby. I have always traveled alone for business and pleasure. The more you do it, the more confident you will become and the more you will enjoy it. Do some research online before your trip so that you have a list of things you would like to see, do, and eat while you are visiting that area. You may not make it to all of them, but it is great to have plans, addresses and phone numbers to help you make the most of your visit. 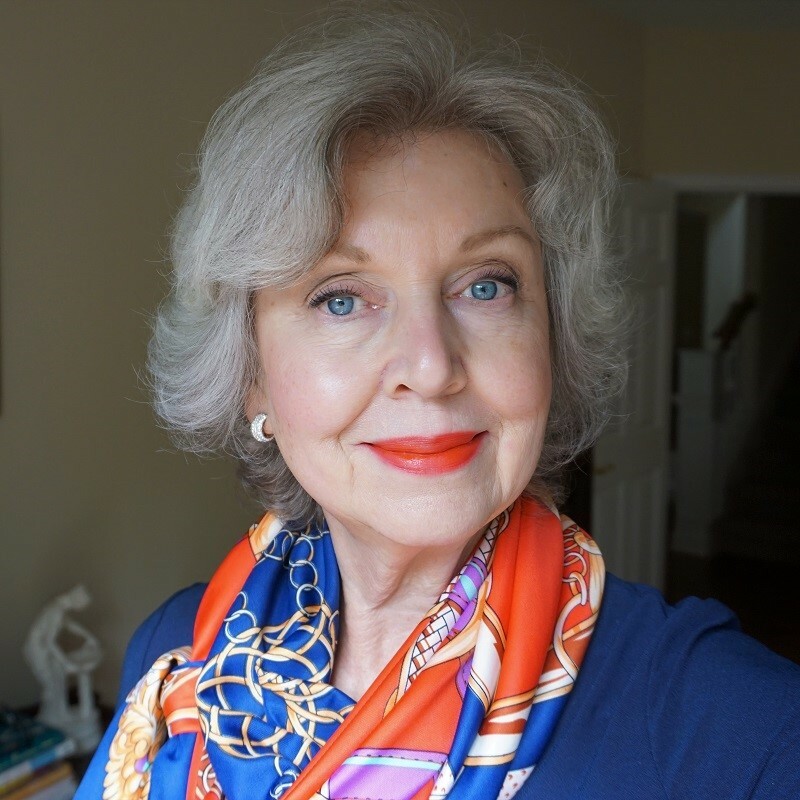 I am a sixty-nine year old widow and have taken many solo trips (now venturing to Europe) since my husband died in November 16, 2011. Exactly seven years ago today. Every trip has been very enjoyable. I take three to four each year. I travel with reputable tour companies. I feel safe, have company if I desire, all is planned extremely well, both itinerary and lodging. All it takes is a phone call. In June I celebrated my birthday in Wales on a trip with Backroads Tours and it was very special. When flying internationally, I find that the airport and airline personnel are most helpful. In the summer I travel alone by car to cottage country for two to three weeks for a music festival. I stay at the same motel and now feel a kind of homecoming both at the motel and in the town. It takes me two and a half hours. But I feel safe where I go. From my destination I take little side adventures. But always, safety is my top priority. Thank you, so much for sharing your lovely comment. You inspire me! Susan, you have amazing skin! Not wearing foundation has to be so liberating. Unfortunately, I have broken capillaries and cannot go “au naturel” although my skin itself is smooth, the redness is just there to stay. I have been on the search for a new skin care routine and have tried Elemis. It’s really great but the cost is exorbitant. I may just have to try Beauty Counter. And I’ve meant to tell you, thank you for not having a million pop ups and ads on your site, it makes it a pleasure to visit! And where do I order those beautiful eyes? Wow! Your skin does look amazing. I thought your lipstick was orange, but it must be just the computer lighting. Anyway, it looks good on you. Thanks for your blog, I really enjoy it. I’m going to definitely look into this product. It looks like a miracle in a bottle! I have very delicate skin and therefore most resurfacing skin care products are too harsh for me, especially in the winter months. You are an excellent testimonial for this product. 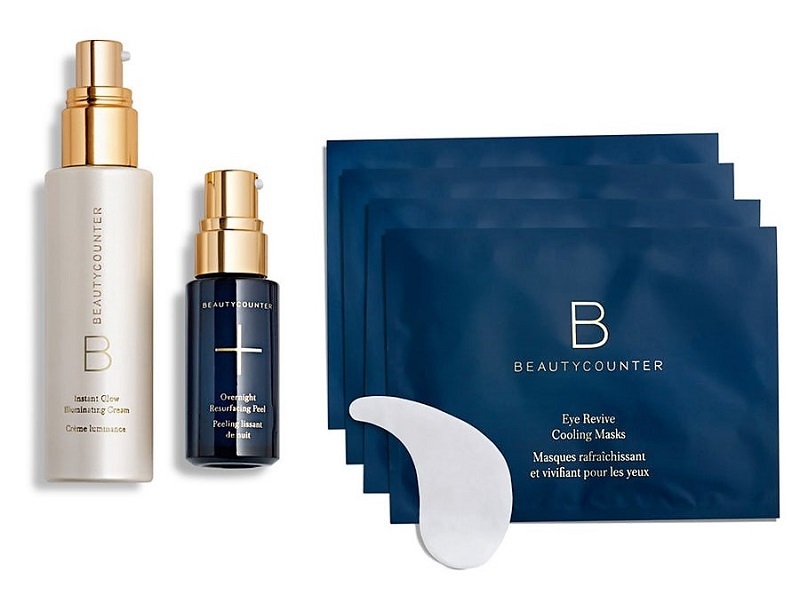 Is there a promotional code for your BeautyCounter site perhaps for free shipping? I was getting ready to order over $150 dollars in products, but noticed a shipping charge was added. I’m sorry, I don’t have a code for that. The items come carefully wrapped in a sturdy box. Absolutely beautiful skin and it truly glows. As I spent a bit of time this morning cleaning up my email subscription preferences, your blog was one I knew I’d be keeping. You remain relevant, you stay up-to-date and I love your pragmatic and positive outlook on the changes that come up. Thank you! Good morning Susan, Lovely picture. Sadly my genetics plays a big part in the condition of my skin. Very oily. Have tried the Beauty Counter #3 serum and love the way it helps the oiliness. I do have a question though. Have you or any of your readers run across a brow pencil that is gray? I was born with dark brown hair and black eyebrows. My hair is now gray and it is so hard to find a gray pencil that doesn’t have a red tone to it. My brows have thinned and I need to fill in areas. The gray seems to be the way to go to avoid the dreaded harsh eyebrow. The one that I did use has been discontinued and am now using a universal taupe. It’s okay, but not as light as I would like. I looked at the beauty counter brow pencils, but they seem to be for those that have lighter brows. I have a medium/cool skin tone. Any help would be appreciated. I have to resort to a taupe brow color as well. I hope someone has good charcoal or gray suggestions for us. I use a grey eyebrow pencil from Marcelle. The colour is “Granite”. I have ashey grey hair, blue eyes and very sparse brows and find this product/colour very natural looking. Marcelle is a Canadian company so I don’t know if it is available in the USA. In Canada I buy it at WalMart. You glow with health. You’re a real beauty. Enjoy your road trip. Thank you for the “Patting” tip. Would you consider doing an skin care routine on video so we can see the patting technique? I would love to see a demonstration and I will try it also. Thank you very much! I will share a video soon. Dear Susan: Would you share how often you see an Esthetician and what exactly she does? Love your blog, thanks for all you do! I get a facial about five or six times a year. She does something different each time according to my skin. (My skin might be very dry or breaking out for example.) It is good to go to the same person so that they get to know your skin. The lady I go to uses only her hands and natural products and is always very gentle. I have been to some who are rough or use instruments to manipulate the skin. I came home from one such experience, and my face was bleeding. Susan, I’ve followed your blog for years – love it! I’m interested in ordering some of the Beauty Counter products but would need a recommendation. I have very good skin, small pores, quite smooth and fair (lots of freckles and brown spots from years living in the sun!) but no bad spots. My skin is becoming dryer and dryer and showing more wrinkles. What skin care product would be best? The Recovery Sleeping Cream or the Rejuvenating night cream? I’d like to start with one product, see how I like it and go from there. P.S. I live in Richland, Washington in the eastern side of Washington State, where we have a high desert climate. Hot and dry in the summer and quite cold an dry in the winter. It’s always dry! Also, a very active 77 year old. The No. 1 Brightening Facial Oil is what I would recommend. I love it when my skin gets dry in winter. https://www.beautycounter.com/susanstreet?goto=/product/no-1-brightening-facial-oil Apply 4-6 drops onto face, alone or under moisturizer. Susan, what other products do you use with the resurfacing peel? A moisturizer? Eye cream? Day cream? Or is that the only skincare product you use? Could you tell me what the cost of the resurfacing cream is and what the shipping charges are? I would like to possibly purchase it without other items. Thank you so much. I look forward to your blogs. The cost of the cream is $58. (It lasts for months.) The cost of shipping is about $6 in the USA. Your skin looks amazing. And, kudos to you for taking a closeup photo without makeup…I couldn’t do it! I live in Ireland. I heard a Beauty Therapist on TV say that Serum is much better for skin than Moisturiser. She further stated that Serum goes deep down into skin, whereas Moisturiser just says on surface of skin. What are your views on this. I noted from examining serums at Beauty Counters that they are more expensive than Moisturisers. I love your e-emails and find them inspirational. I use the serum first and then a moisturizer. I like the way a moisturizer makes my skin feel more soft and supple which is temporary. My skin has a smooth texture and a more healthy appearance after using the Resurfacing Peel. That difference is evident even after washing my face. Susan, I’ve been thrilled with the Beautycounter products I’ve ordered from you. Just recently, I ordered the Overnight Resurfacing Peel, and already I can see a positve difference in the texture of my skin. So happy with these products! Thank you! I’m so glad you are happy with your products. Your skin always looks great! Are Beauty counter products scented? I have to use Clinique to avoid scents of any kind. Fragrances are not added, but the natural products used will have a scent. For example, the No. 1 Brightening Facial Oil smells a little like orange juice, but that is because of the citrus oils used. Scroll down on the description page of each item to read how to use it and also a list of the ingredients. Am I right that BeautyCounter will not ship to Canada? At this time, they only ship to the US and its territories. They actually do ship to Canada. I know this as my hairstylist is a consultant here in Toronto. When you go to Susan’s link, click on the U.S. flag (top left corner) and a drop down menu for Canada English and French will show. Click on the appropriate one and it will convert the prices to Canadian dollars. Unfortunately, I’m not sure if Susan will get the commission on this. Yes, I managed to be forwarded to beautycounter.ca and received my order today. I received the Overnight Surfacing Peel and after only 2 nights, I see an amazing difference. I had flakes on my forehead which exfoliation and moisturizer would not eliminate but after only two nights of the peel, it has been reduced by 90%. That’s wonderful news! I’m so glad it is helping you also. Season’ greetings, Susan! Have been dithering and deliberating about the BC re-surfacing peel and have decided that it’s an investment I’m willing to make. Your photos and comments were enough to spur me into action. We should all be as lovely and genuine as you! That said, I wanted to let you know that after I’d completed the initial part of the order form, I tried to list you as my consultant and have not been able to get past that screen to complete the transaction. It’s only fair that you get the credit for this ct purchase; while familiar with BC, would not have considered buying save for your review AND incredibly radiant images. It’s very likely that I’ve inadvertently skipped/missed a step. I would appreciate any advice or technical support as I am so excited to start using this product. Thank you in advance for any assistance you might provide. If you clicked on the link in my post to get to the product page, I will get credit for the sale. Thank you! Based on the glowing reviews, I have just purchased this peel. Thanks, Susan! I hope it gives you your best skin ever also! I will be going over your entire site….dressing nice is so feminine. You are so inspirational Susan! The best product for uneven skin tone is the Overnight Resurfacing Peel here. I hope that you discover the source of your illness and that you return to good health.